The path to partnership can be instantaneous or a journey. 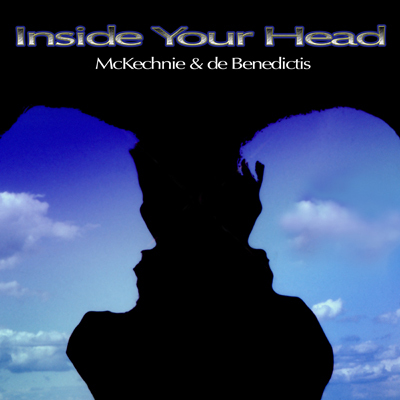 In the case of McKechnie & de Benedictis, it was a journey. From teacher and student to colleague and partner, developed over years in the studio programming synths and experimenting with recording and mixing, and after getting Rhodes Chroma synthesizers in 1982, (serial numbers 104 and 105). The duo starting making music and playing live together, first as “New Logic”, then McKechnie & de Benedictis, and ultimately as partners in “The San Francisco Synthesizer Ensemble.” Today, they re-release “Inside Your Head”—a 60-minute work of extended live-to-tape synthesizer improvisations and compositions, re-mastered for digital and available on streaming services including Spotify, Tidal and Apple Music, and download platforms, including iTunes, Amazon, and CD Baby. The rendering of “Inside Your Head” was in many ways the culmination of years of dedicated exploration of new and ground-braking instruments and the industrious collaboration between Doug McKechnie, an early live performer with the Moog modular synthesizer in the late 1960s, and Paul de Benedictis, an avid student of music, music software, and synthesizers in the early 1980s. When they began performing as the duo “New Logic” they collaborated with visionary and master photographer Wernher Krutein in a series of concerts called “The Electric Travelogue.” For the release of “Inside Your Head” the duo reconnected with Krutein to have him create visuals and direct a video for one of the musical selections, Embryo, available for viewing on YouTube (https://tinyurl.com/embryo-vid). The entire collection of pieces comprising “Inside Your Head” were recorded by the duo mostly at Doug McKechnie’s studio on Potrero Hill in San Francisco in 1983. In a series of sessions lasting only a few days, inspired by their Rhodes Chroma capabilities like its arpeggiator, and Wernher’s stunning visuals, Doug and Paul improvised the music in several live overdubs that resulted in a dream-state assemblage of otherworldly musical landscapes. All other trademarks are the property of their respective holders. Description and specifications are subject to change without notice.